Origin of name  James McBride was once encamped on the banks of Rip Rap River in Virginia. The rain falling on his plantation home remined him of the sound of the river, so the plantation became known as Rip Raps (4). 1806  James Bradley owned the property. There was a log house on the swamp but the Bradleys deemed it to be located in an unhealthy environment and constructed a two-story house. That structure would later be used as a barn and retained the curving staircase that had been part of the home (1, p. 3). 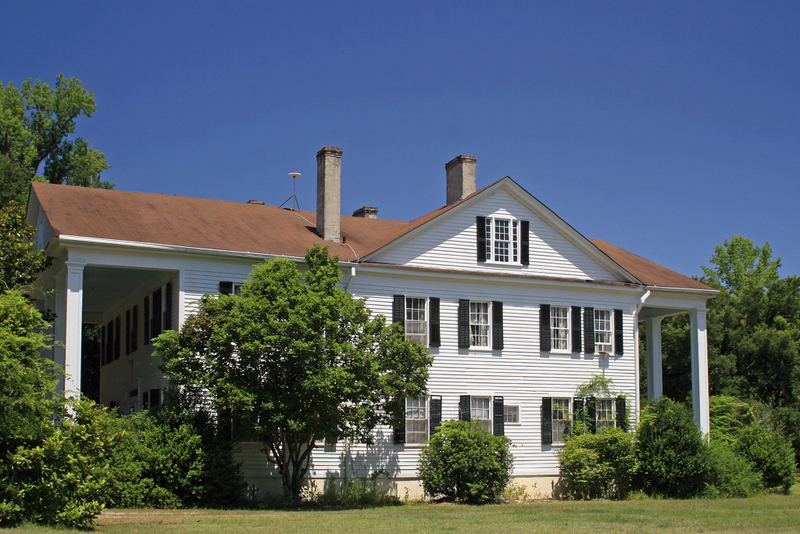 Early 1820s  Samuel McBride had acquired the property. He expanded the plantation to be approximately 10,000 acres and constructed another house, which later would be torn down. During this time, Samuel McBride's property was known as Egypt Farm (1, p. 3). 1850  Samuel McBride passed away and his young son James Samuel McBride inherited the plantation (1, p. 3). 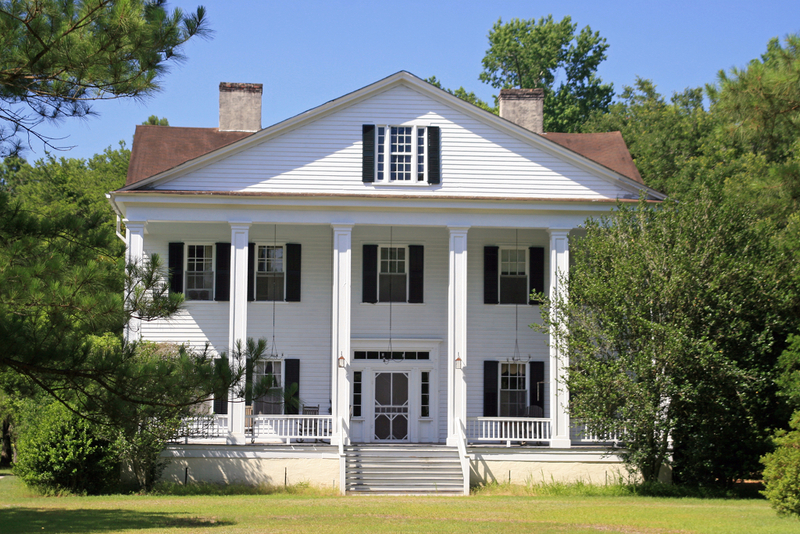 1858  James Samuel McBride constructed a Greek Revival house which he called Rip Raps (1, pp. 2-3). 1864  James Samuel McBride suffered from tuberculous most of his life and died at the age of 23 leaving his wife, Sophronia Warren McBride, with two young children and the plantation which had a large mortgage. Sophronia's father helped manage the plantation with her until her children were able to assist (5, Part II). 1893  Sophronia Warren McBride divided the plantation between her two children. Daughter Alice Maude McBride Dabbs received the northern section with son Guy Warren McBride the southern section which contained the Rip Raps house. Sophronia and Guy lived at Rip Raps (5, The Dabbs-McBride Marriage). 1915  Guy was very fond of his nephew, James McBride Dabbs, and wanted Rip Raps left to him. Guy passed away in 1914 with his mother Sophronia one year later. Sophronia honored her son's wishes and the plantation passed to her grandson (1, p. 3) (5, The Dabbs-McBride Marriage). 1970  James McBride Dabbs, a celebrated author, made the plantation his home until his death in this year. Rip Raps then became the property of his widow, Edith Mitchell Dabbs. Edith was also an noted author best known for her writings on the Penn Center (1, pp. 1, 3). 1991  Edith Mitchell Dabbs passed away (6, p. 2).
?  Dickie Dabbs, son of James and Edith Dabbs, became the next owner of Rip Raps Plantation (7). A circa 1830 smokehouse and two-story carriage house were also still standing in 1978 (1, p. 3) (2). Information contributed by Bill Segars.